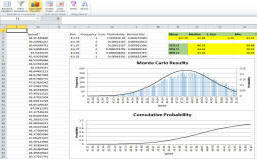 RC Monte Carlo is an Excel application that automates the design of Monte Carlo simulations. The user generates the random numbers using automated dialog boxes and then completes the reconstruction by entering accident reconstruction formulas into Excel. Statistical results including charts are provided at the click of one button! Random number generator including normal and continuous uniform distributions. Filters allow the user to eliminate impossible reconstructions from the results. For example, if an EDR reports the delta-V for one car to be between 20 and 25 MPH, the filter will strip out all reconstructions that do not meet that criteria. Cell comments automatically added to remind the user of distribution and filter settings. Automatic statistical results and charts provided at the press of a button. Custom accident reconstruction formulas hard coded into the application include Conservation of Linear Momentum equations, CRASH3 algorithm equations, airborne, Searle, and more! Built-in capability to solve momentum problems where vehicle 1 is NOT approaching on the x-axis. Great for assigning uncertainties to both vehicles' approach angles. It is not necessary to assume that one vehicle was approaching at 0 degrees. All commands added to a new tab on the ribbon. Built-in Help system including tutorial videos. 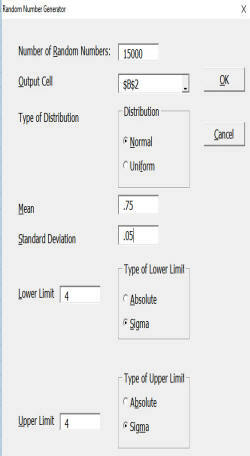 Printed reports print out inputted ranges, distributions, charts and statistics. A PC running Microsoft Excel 2007 or greater. RC Monte Carlo is $99 for first-time buyers. You are permitted to install the program on two computers. Additional computers in excess of two (for an individual) are $49 each. Minor release updates (example 1.0 to 1.1) are free. Major updates (example 1.1 to 2.0) will cost $49. Upgrade prices subject to change, but will always be less than current new customer prices. Download a free, fully functional demo version. To purchase RC Monte Carlo, use the free demo version for 10 days (click on link above). After the demo version expires, you may purchase a license online via a link in the program.